Draft: 2009, Boston Red Sox, 2nd rd. Resides in College Station, TX during the offseason with his wife, Kristin, son, Jhett, and daughters, Rosie and Whelynn... Participates in the Autographed Memorabilia Donation and Dreams Come True programs; attended Keeping Kids in the Game; participated in the Pitch, Hit and Run pregame ceremony, the Tigers Winter Caravan and TigerFest... Attended Texas A&M University...went 6-6 with a 4.22 ERA (89.2IP/42ER) and two saves in 24 appearances (eight starts) as a junior in 2009...earned All-Big 12 honorable mention in 2008 after fanning a team-high 120 batters and limiting opponents to a .237 (80x337) batting average... Pitched for Winthrop (SC) University in 2006 and 2007...earned First-Team All-Big South in 2007...named Collegiate Baseball's National Freshman Pitcher of the Year in 2006 after winning 13 games... Pitched for Falmouth in the Cape Cod League in 2007 and 2008... Attended Hurricane (WV) High School...named the Gatorade Player of the Year in 2005. Appeared in a career-high 66 games for the Tigers in 2017 ... Recorded his first save of the season on April 12 vs. Minnesota...added another save on May 18 vs. Baltimore ... Did not allow an earned run in 13 consecutive outings from April 22-May 23 ... Pitched in 14 games during May, carrying a 1-1 record with one save, a 1.32 ERA (13.2IP/2ER) and seven strikeouts ... Recorded the 200th appearance of his Major League career on June 25 at San Diego ... Appeared in 13 games during August and went 1-0 with a 1.74 ERA (10.1IP/2ER) and eight strikeouts ... On suspended list from September 2-5. Established career highs in wins (4), appearances (62), innings pitched (73.0) and strikeouts (49) with the Tigers in 2016... Placed on the 15-day disabled list on April 2, retroactive to March 25, with right shoulder soreness... Began an injury rehab assignment with Single A Lakeland on April 7 -- appeared in four games, including one start, between Triple A Toledo and Lakeland during the injury rehab assignment and posted a 0-1 record with a 7.20 ERA (5.0IP/4ER) and seven strikeouts...Activated from the 15-day disabled list on April 16... Did not allow a run in his first seven appearances of the season from April 17-May 1, a stretch that spanned 8.0 innings... Appeared in 11 games during June and had a 1.84 ERA (14.2IP/3ER) and 12 strikeouts... Recorded his first win of the season on July 26 at Boston, pitching 0.2 scoreless innings…also picked up the win on September 5 at Chicago (AL), September 9 vs. Baltimore and September 22 at Minnesota...Pitched in 10 games during July and compiled a 1-0 record with a 0.00 ERA (9.2IP/0ER) and four strikeouts...Had a career-long 14 straight scoreless appearances from July 4-August 15 -- during the streak, threw 15.2 scoreless innings with 10 hits allowed, six walks and six strikeouts... Tossed a season-long 2.2 innings on August 29 vs. Chicago (AL)...marked his seventh appearance of 2.0 innings-ormore this season... Lefthanded hitters posted a .239 (27x113) batting average, while righthanders batted .261 (41x157) against him... Compiled a 1-0 record with a 2.11 ERA (38.1IP/9ER) and 26 strikeouts in 30 home games, while he went 3-0 with a 3.89 ERA (34.2IP/15ER) and 23 strikeouts in 32 games on the road... Posted a 2-0 record with a 2.15 ERA (37.2IP/9ER) and 23 strikeouts in 31 games against American League Central opponents... Compiled a 3.58 ERA (37.2IP/15ER) and 29 strikeouts in 33 games prior to the All-Star break, while he went 4-0 with a 2.29 ERA (35.1IP/9ER) with 20 strikeouts in 29 games following the All-Star break. Spent the majority of the 2015 season with the Tigers and compiled a 3-3 record with two saves, a 2.19 ERA (70.0IP/17ER) and 38 strikeouts in 59 appearances. Ranked 10th among American League relievers with a 2.28 ERA (67.0IP/17ER), while he was tied for 11th with 67.0 innings pitched. Assigned to Triple-A Toledo to begin the season, pitching in four games and posting a 1-0 record with three saves, a 0.00 ERA (5.1IP/0ER) and five strikeouts. Recalled from Triple-A Toledo by the Tigers on April 23. Made his Tigers debut on April 24 against Cleveland, entering in the fourth inning out of the bullpen -- in 3.0 innings of work, he allowed one run on two hits with one strikeout. Named Tigers Pitcher of the Month for May after posting a 1-1 record with a 0.86 ERA (21.0IP/2ER) and 13 strikeouts. Recorded his first win as a Tiger on May 21 vs. Houston after tossing 2.0 scoreless innings of relief with two strikeouts in extra innings. Made the first start of his major league career on May 27 vs. Oakland, throwing 3.0 scoreless innings with one walk and one strikeout. Finished the month of June with a 0-2 record, a 1.69 ERA (16.0IP/3ER) and eight strikeouts in 13 appearances. Earned the first save of his major league career on July 30 at Baltimore, throwing 1 2/3 scoreless innings with one hit allowed and one strikeout...marked the first five-out save by a Tigers pitcher since Joaquin Benoit on August 14, 2013 at Chicago White Sox -- also recorded a save on August 5 vs. Kansas City. Threw 12 consecutive scoreless outings (11.2IP) from July 11-August 6...posted a 1-0 record with two saves and seven strikeouts during the stretch. Posted a 3-2 record with one save, a 1.72 ERA (36.2IP/7ER) and 23 strikeouts in 32 games at Comerica Park...went 0-1 with one save, a 2.70 ERA (33.1IP/10ER) and 15 strikeouts on the road. Compiled a 1-3 record with a 2.14 ERA (46.1IP/11ER) and 27 strikeouts in 31 games prior to the All-Star break...went 2-0 with two saves, a 2.28 ERA (23.2IP/6ER) and 11 strikeouts in 28 appearances after the All-Star break. Held lefthanded hitters to a .222 (26-for-117) average...righthanders batted .252 (35-for-139) against him this season. Appeared in 18 games with Boston in 2014 over four separate stints at the major league level...Assigned to Triple A Pawtucket to begin the season...Did not allow a run in his first nine games to begin the season (9.0IP)...Did not allow a run in 26 of 35 games with Triple A Pawtucket, leading the team with six relief wins and six holds...Recalled by Boston from Pawtucket on April 23 -- optioned back that same day...Recalled by Boston from Pawtucket on May 23 -- optioned back to Pawtucket on May 25...Recalled by Boston from Pawtucket on May 28...Allowed the first home run of his major league career on May 31 versus Tampa Bay...had not allowed a home run in the first 27 games of his major league career...Optioned back to Pawtucket by Boston on May 31...Recalled by Boston from Pawtucket on August 1 -- optioned back to Pawtucket on August 2...Recalled by Boston from Pawtucket for the remainder of the season on August 10...Limited opponents to a .198 (20x101) batting average with the Red Sox...Earned his only win of the season on August 16 versus Houston...Retired 24 consecutive batters from August 14-23...Tossed a career-high 3.2 innings on August 23 versus seattle -- did not allow a run and allowed just one batter to reach base. Went 1-1 with a 4.88 ERA (15 ER/27.2 IP) in 26 relief appearances over 3 stints with BOS...Did not allow a HR with the Red Sox. Made ML debut with 1.0 scoreless inning on 4/11 vs. BAL...Became the 1st Saudi Arabian-born pitcher to appear in an MLB game and the 2nd player overall (Craig Stansberry, 2007-09). Did not allow a run over his first 6 ML appearances (6.0 IP) from 4/11-27 becoming the 1st Red Sox pitcher to do so since Ed Phillips' 6-game stretch (8.0 IP) to start his career in 1970 (later in the season, Drake Britton posted 7 scoreless games to begin his ML career (9.0 IP) from 7/20-8/4. Held opponents to a .176 AVG (3-for-17) with RISP over 1st 10 appearances for BOS. Earned 1st ML win in the Sox' 3-2 victory in 10 innings on 5/17 at MIN. Threw more than 1.0 inning in 9 of 26 games...Threw a career high 2.2 IP twice, 5/3 at TEX and 6/13 at BAL. Allowed runs in only 2 of 14 appearances at Fenway Park (3.09 ERA, 5 R/4 ER, 11.2 IP). Began season with Triple-A Pawtucket and appeared in only 2 games before beinga recalled by BOS on 4/10. Placed on 15-day DL with a right thumb sprain on 7/9 and transferred to 60-day DL on 8/31...Made 6 regular season rehab appearances for Pawtucket, posting a 2.84 ERA (2 ER/6.1 IP) in those games...Also appeared in 4 playoff games with the PawSox (3 ER/3.1 IP) and earned the win in Game 1 of the International League's Governor's Cup Finals at Durham, throwing a scoreless 7th inning in the 2-1, come-from-behind victory. Underwent surgery on his right thumb on 10/17…The procedure was performed by Dr. Thomas George in Cleveland, OH. Spent entire season with Triple-A Pawtucket...Made 3 starts to begin the season and came out of the bullpen for his last 37 games, his 1st professional relief outings. Posted a 3.36 ERA (22 ER/59.0 IP) and recorded 62 strikeouts in relief...His 9.46 SO/9.0 IP rate out of the bullpen ranked 3rd among International League relievers. Led the PawSox in outings and relief innings...Tied for the International League lead with 3 balks. Collected 1st save on 7/2 vs. Rochester. Struck out 5 in 4.2 perfect innings over 4 playoff games en route to Pawtucket winning the Governors' Cup championship... Tied for 1st among IL playoff leaders in appearances with teammate Jose De La Torre. Entered the season as the No. 11 prospect in the Red Sox system, No. 3 pitcher, according to Baseball America...Also chosen by the publication as having the system's best fastball and best slider. Named Red Sox Minor League Pitcher of the Year after combining for a 3.11 ERA (46 ER/133.0 IP) between Double-A Portland and Triple-A Pawtucket, the best mark among fullseason Red Sox farmhands...Ranked 2nd among organizational leaders with 123 strikeouts and 10 wins and was 3rd in innings...Began the season with Portland...At the time of his 8/16 promotion to Pawtucket, was 5th in the Eastern Leaguewith a 3.05 ERA (38 ER/112.0 IP) and tied for 5th with 9 wins...Was also leading the Sea Dogs with 99 K's...Had a 2.76 ERA (30 ER/98.0 IP) over his last 18 Double-A starts from 4/28-8/13...Named to the Eastern League All-Star Game...Was also tabbed Sea Dogs Pitcher of the Year via fan voting...Finished the year with the PawSox...Allowed 3 runs or less in all 4 starts for the club, striking out 24 batters in 21.0 innings in his Triple-A debut...Made 1 postseason appearance for Pawtucket, allowing 3 runs in 7.0 innings with 6 K's in a series-clinching loss vs. Lehigh Valley in Game 3 of the Governors' Cup semi-finals. Ranked among Red Sox minor leaguers in games started (1st, 27) and strikeouts (5th, 106) between High-A Salem and Double-A Portland in his 1st full season...Combined to go 6-6 with a 5.31 ERA (79 ER/134.0 IP) at the 2 stops...Began the season with Salem and posted a 3.40 ERA (21 ER/55.2 IP) with 50 strikeouts over 11 starts with the club, including 8 outings allowing 2 earned runs or less...Selected as a mid-season Carolina League All-Star but did not participate in the exhibition...Placed on DL on 6/5 and immediately sent to Portland upon his 6/15 reinstatement for his 1st Double-A action...At time of his promotion, was leading the CL in opponent batting average (.212) and ranked 5th in WHIP (1.04)...Went 3-0 over 4 Eastern League starts from 7/7-22, posting a 2.66 ERA (7 ER/23.2 IP) in that time...Recorded 8 strikeouts in back-to-back starts on 8/22 at New Hampshire and 9/1 vs. Binghamton...Landed on the DL again from 8/2-10...Posted a 2.85 ERA (13 ER/41.0 IP) over with the Sea Dogs in 7 starts over 5.0 innings...Following the season, was rated by Baseball America as having the best slider in the Red Sox farms system. Made his pro debut with Short-A Lowell, compiling a 0.50 ERA (2 ER/36.0 IP) over 13 starts, none longer than 3.0 innings...Led all Short-Season A hurlers (min. 30.0 IP) in ERA...Limited foes to a .085 (10-for-118) average...Fanned 7 in a scoreless 3.0-inning start in his only playoff appearance...Following the season, ranked by Baseball America as the No. 9 prospect in the New York-Penn League and rated as having the best slider in Boston's farm system. April 19, 2019 Milwaukee Brewers activated RHP Alex Wilson from the paternity list. April 17, 2019 Milwaukee Brewers placed RHP Alex Wilson on the paternity list. March 24, 2019 Milwaukee Brewers signed free agent RHP Alex Wilson. March 22, 2019 Columbus Clippers released RHP Alex Wilson. March 22, 2019 Cleveland Indians released RHP Alex Wilson. February 9, 2019 Cleveland Indians signed free agent RHP Alex Wilson to a minor league contract and invited him to spring training. February 9, 2019 RHP Alex Wilson assigned to Columbus Clippers. November 30, 2018 RHP Alex Wilson elected free agency. June 7, 2018 Detroit Tigers activated RHP Alex Wilson from the 10-day disabled list. 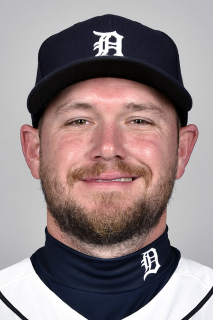 June 5, 2018 Detroit Tigers sent RHP Alex Wilson on a rehab assignment to Toledo Mud Hens. May 8, 2018 Detroit Tigers placed RHP Alex Wilson on the 10-day disabled list. Left plantar fascia strain. September 5, 2017 Detroit Tigers activated RHP Alex Wilson. September 2, 2017 RHP Alex Wilson roster status changed by Detroit Tigers. April 16, 2016 Detroit Tigers activated RHP Alex Wilson from the 15-day disabled list. April 12, 2016 Detroit Tigers sent RHP Alex Wilson on a rehab assignment to Toledo Mud Hens. April 7, 2016 Detroit Tigers sent RHP Alex Wilson on a rehab assignment to Lakeland Flying Tigers. April 23, 2015 Detroit Tigers recalled RHP Alex Wilson from Toledo Mud Hens. March 24, 2015 Detroit Tigers optioned RHP Alex Wilson to Toledo Mud Hens. August 14, 2014 Boston Red Sox recalled RHP Alex Wilson from Pawtucket Red Sox. August 3, 2014 Boston Red Sox optioned RHP Alex Wilson to Pawtucket Red Sox. August 1, 2014 Boston Red Sox recalled Alex Wilson from Pawtucket Red Sox. June 1, 2014 Boston Red Sox optioned RHP Alex Wilson to Pawtucket Red Sox. May 28, 2014 Boston Red Sox recalled Alex Wilson from Pawtucket Red Sox. May 26, 2014 Boston Red Sox optioned RHP Alex Wilson to Pawtucket Red Sox. May 23, 2014 Boston Red Sox recalled Alex Wilson from Pawtucket Red Sox. April 24, 2014 Boston Red Sox optioned RHP Alex Wilson to Pawtucket Red Sox. April 23, 2014 Boston Red Sox recalled Alex Wilson from Pawtucket Red Sox. March 13, 2014 Boston Red Sox optioned RHP Alex Wilson to Pawtucket Red Sox. November 4, 2013 Boston Red Sox activated RHP Alex Wilson from the 60-day disabled list. August 31, 2013 Boston Red Sox transferred RHP Alex Wilson from the 15-day disabled list to the 60-day disabled list. Sprained right thumb. July 30, 2013 Boston Red Sox sent RHP Alex Wilson on a rehab assignment to Pawtucket Red Sox. July 9, 2013 Boston Red Sox placed RHP Alex Wilson on the 15-day disabled list. Sprained right thumb. June 18, 2013 Boston Red Sox recalled RHP Alex Wilson from Pawtucket Red Sox. June 18, 2013 Alex Wilson roster status changed by Boston Red Sox. June 14, 2013 Boston Red Sox optioned Alex Wilson to Pawtucket Red Sox. June 13, 2013 Boston Red Sox recalled Alex Wilson from Pawtucket Red Sox. May 29, 2013 Boston Red Sox optioned Alex Wilson to Pawtucket Red Sox. April 10, 2013 Boston Red Sox recalled Alex Wilson from Pawtucket Red Sox. March 16, 2013 Boston Red Sox optioned Alex Wilson to Pawtucket Red Sox. November 20, 2012 Boston Red Sox selected the contract of Alex Wilson from Pawtucket Red Sox. February 16, 2012 Boston Red Sox invited non-roster RHP Alex Wilson to spring training. August 16, 2011 Alex Wilson assigned to Pawtucket Red Sox from Portland Sea Dogs. February 2, 2011 Boston Red Sox invited non-roster RHP Alex Wilson to spring training. August 11, 2010 Alex Wilson roster status changed by Portland Sea Dogs. August 2, 2010 Portland Sea Dogs placed RHP Alex Wilson on the 7-day disabled list. June 15, 2010 RHP Alex Wilson assigned to Portland Sea Dogs from Salem Red Sox. June 6, 2010 Alex Wilson roster status changed by Salem Red Sox. April 5, 2010 RHP Alex Wilson assigned to Salem Red Sox from Lowell Spinners. June 28, 2009 Alex Wilson assigned to Lowell Spinners from GCL Red Sox. June 22, 2009 Alex Wilson assigned to GCL Red Sox from Lowell Spinners. June 19, 2009 Alex Wilson assigned to Lowell Spinners from Boston Red Sox. June 17, 2009 Boston Red Sox signed Alex Wilson.